I read the entire trip report, and one thought kept recurring. I want to go there. 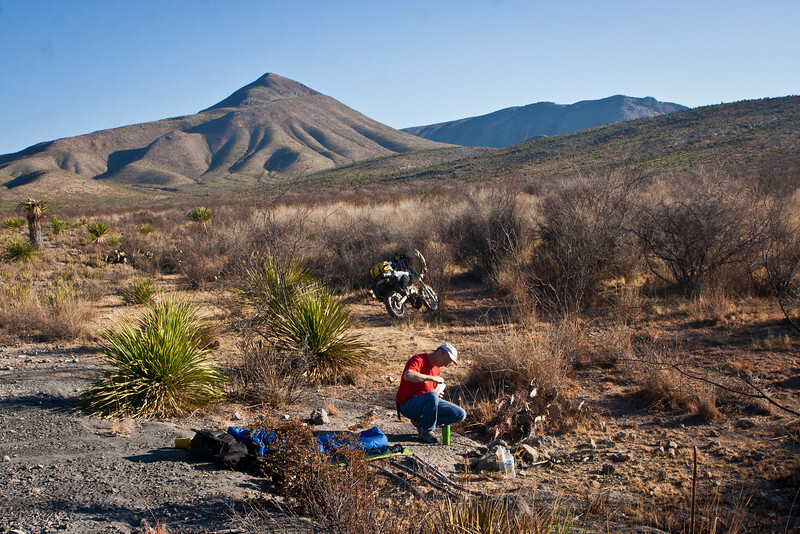 I want to do that - not on a motorcycle, but in my old Jeep, before we both get too old to travel. We might even be able to follow the goat trails. One old goat behind another. Yes, Gentlemen...I am doing this because i have had the pleasure of doing this trail twice and i could say i know this area by heart. Also, i want to share this because when i went there i had no GPS and digital camera at the time. Plus, i was not lucky enough to be one of the chosen ones to learn, some of the ropes of the mighty TJ Avery and his very good camera. His little tokens of knowledge have improve my life exponentially and now i capture life's greatest moments at will. Ok, so moving along with this Bike guys TR. 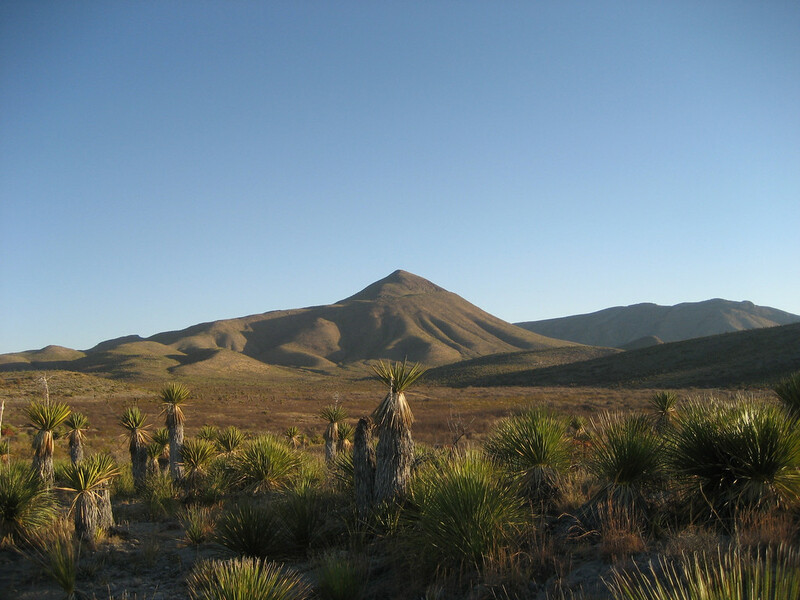 When you continue down the road, there will be a series of big ranches you will be squirming as you near the great,known like the devil with so many names, Burro Range... Sierra del Burro....Serrania del Burro...Burro plains. They are all the same. 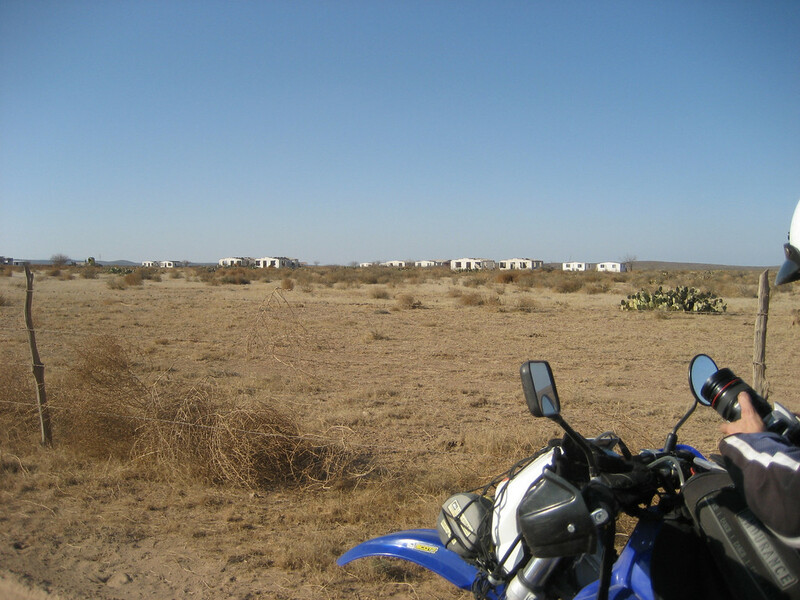 One of them is Rancho El Chupadero del Caballo, which is very easy to get to. 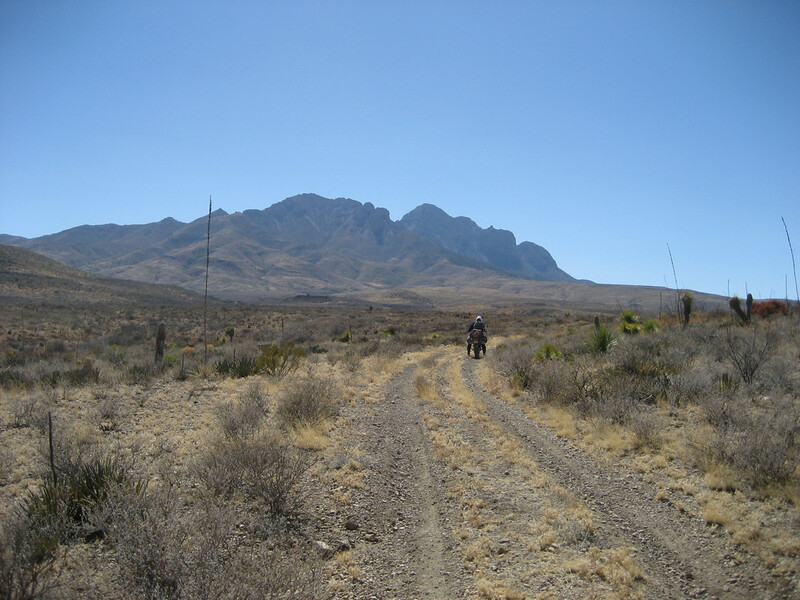 The Camino Real, as the ranchers call it because is a comunal road owned by every one there offers a great opportunity to go hunting and sight seeing in the Sierra del Burro range. 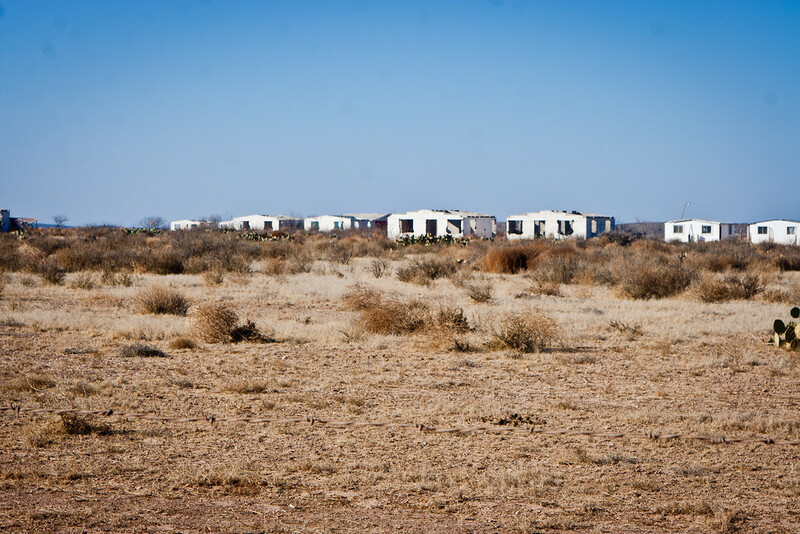 If you check out the Gallery link , there should be great pics of the ranch house and foremen working there. 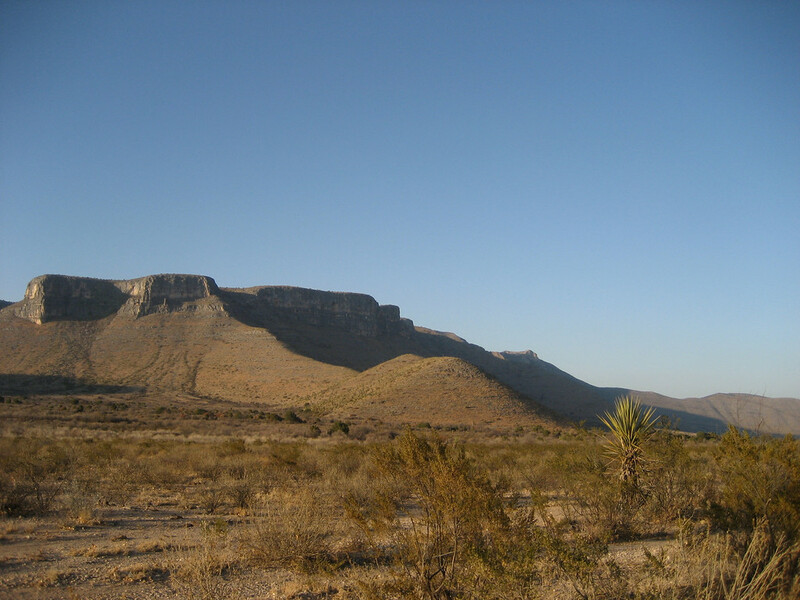 The ranch coordinates area easily obtainable with a general Google search and the opportunity to check out natural rock formations while there is a great experience, never to be forgotten. 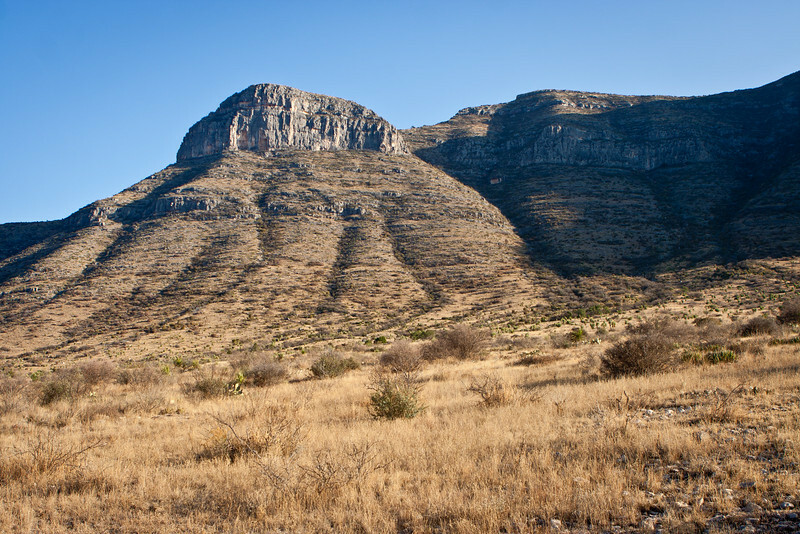 Going all the way to Manuel Benavides, Chihuahua is part of an incredible journey, and the initial phase is revealed at Chupadero Ranch. Then there are more nearby ranches such as Santo Toribio, El Cedrito where recently the incredible damaging wildfires of the Coahuilan high Sierras were scorched by these inmense fire spread. 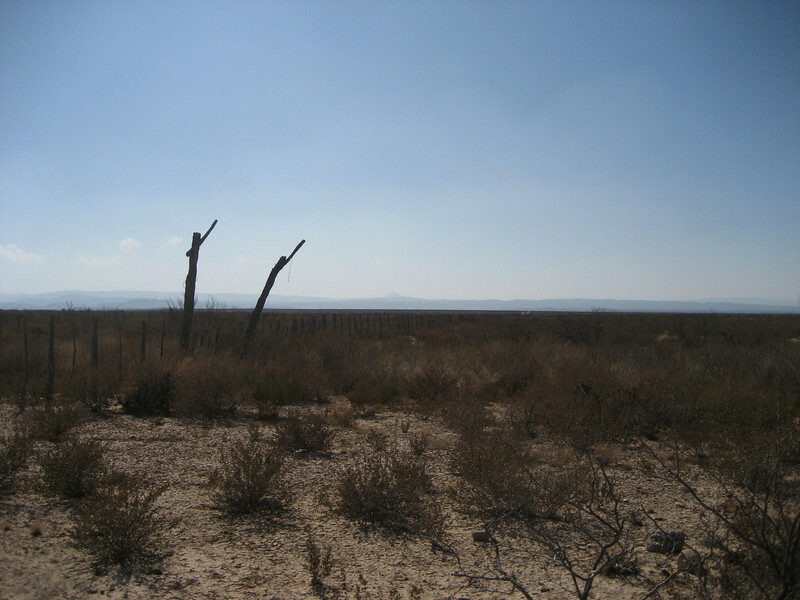 When you are here, you look in to the foreground and slowly but steadily begins to reveal the great Mountain range of the Majestic Sierra del Burro. (Always saty to your right in any given fork in the road). There are more Web pictures of nearby areas long the way, which i higly recommend you check out. 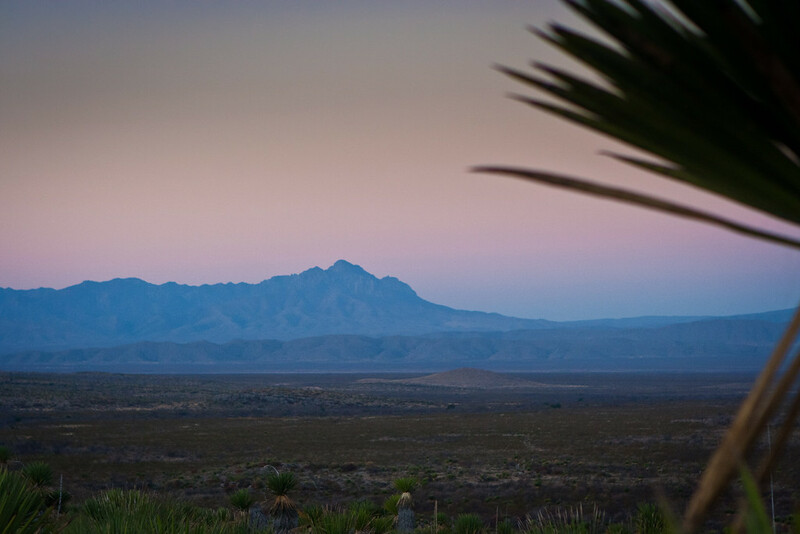 Once you leave these ranches behind, you will come across Ejido Braulio Fernandez, named after a long time a go Governor of Coahuila. Now abandoned by the hardships of self sustainability. As opportunity presents itself. There comes a time when small villages struggle to stay a float and survive the hardships, this beautiful hard land relenquesh. It is not easy to enjoy the bitter sweet honies of the Burro range and if you try to defeat it, it will defeat you. 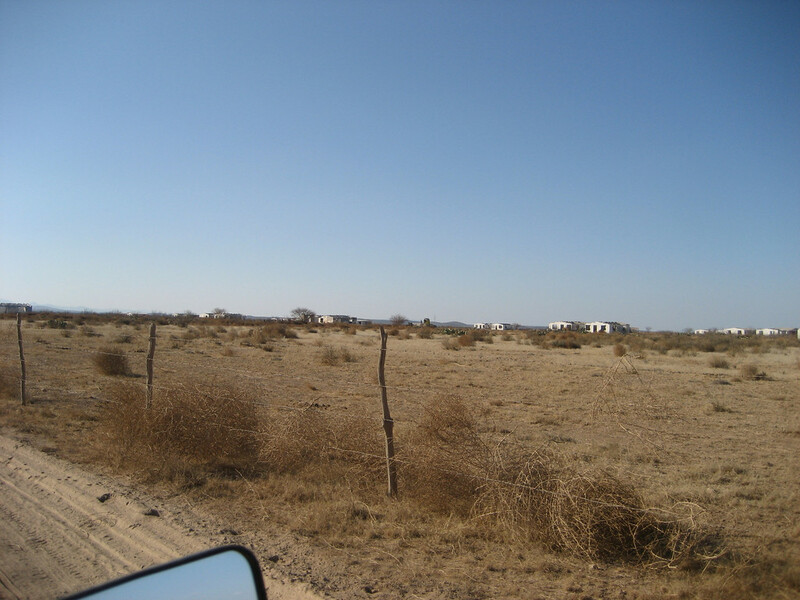 If you see that wire fence along the road, it is because Manuel Benavides could not survive alone out yonder and eventually it's inhabitants left the hardships of the land seeking a better way of life, either in the nearby City of Muzquiz or find work in a ranch or just go back to Acuna defeated by the weather and climate of the area. But as i said before, opportunity presents to another valiant who calls this, his/her golden chance and reclaims the land for him/her and works it again. This time on a more retribuitable way...as part of a ranch. It is not rare to hear, all of a sudden the crackling of the ham radio, inside your vehicle and you hear a nervous giggle of a fellow 4x4 rider, asking the trail column if it is worth it to go any further...or just, chicken out. 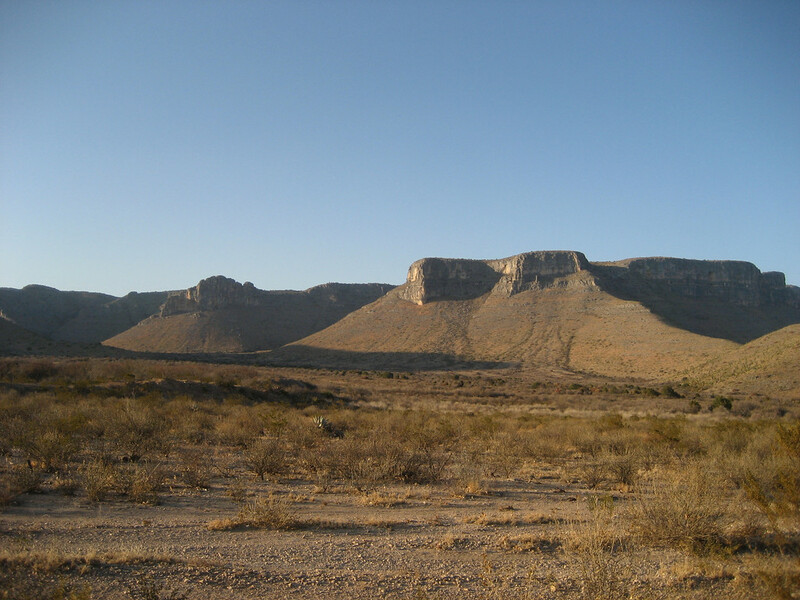 The Canon del Colorado in Coahuila, holds many misteries. Long time urban legends, many area myths and misteries, that if you are travelling alone thru there. It is best to just get your mind busy with other thoughts or else, it will begin to take control of you and succumb to panic, from all the things you have heard, by the area ranchers. I always say, it is best to press on...I mean, you are there. 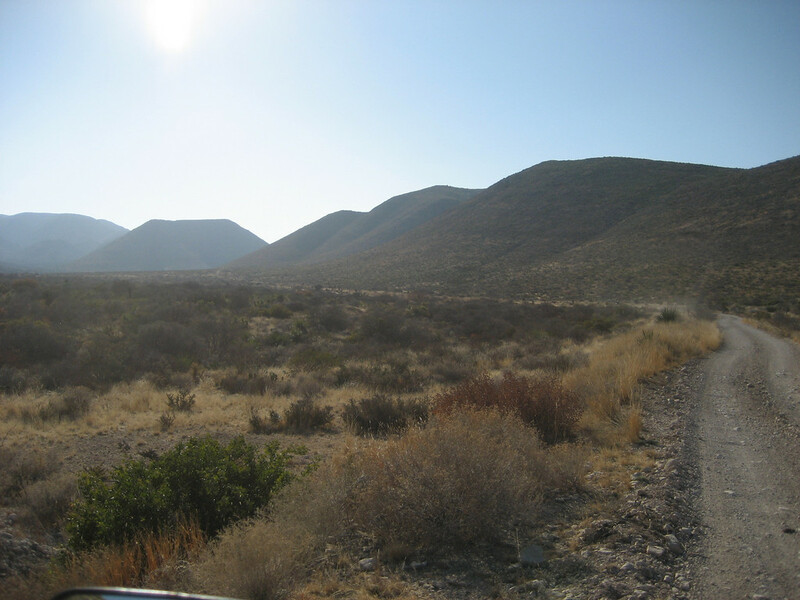 To get out of Canon del Colorado is to travel back at least 230 kilometers to Acuna. I just like to go forward. 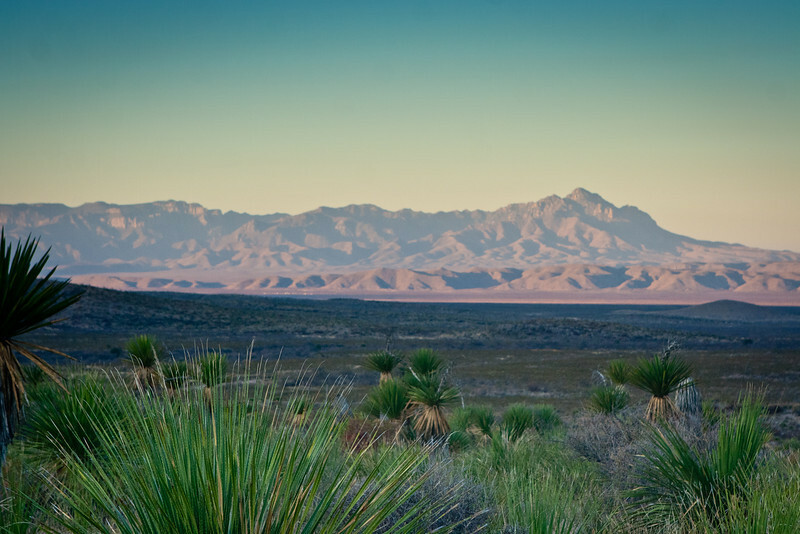 It is also the place where the Burro Range regroups itself and begin to twine left and right and grants us with the best Eye Candy, one can find in true solitude. 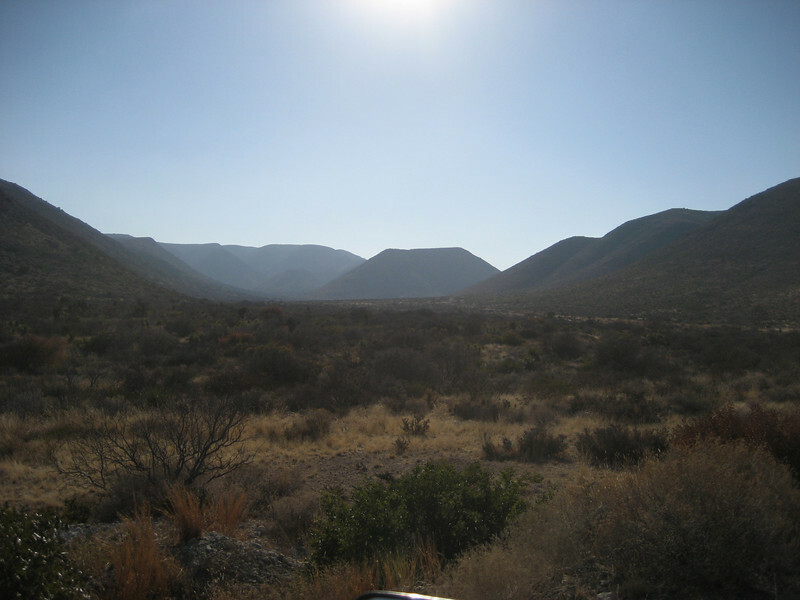 The Majestic Ridge line of the Sierra del Burro Range. With all it's capricious beauty, El Canon del Colorado still holds it's ground and only invites to explore and go thru it's corridor the ones who are willing only to respect it's surroundings, explore it's column like peaks and scout the area for any rareties. There atill are, so many there. Even the Flora changes there, it is like an Oasis there. I have not explored it enough, but i bet there should be more watering holes and springs. One more , before i call it a night. ...some of the ropes of the mighty TJ Avery and his very good camera. His little tokens of knowledge have improve my life exponentially and now i capture life's greatest moments at will. Well, continuing with these great pictures from Milton Otto & Jthompson. Once the Canyon welcomes you. 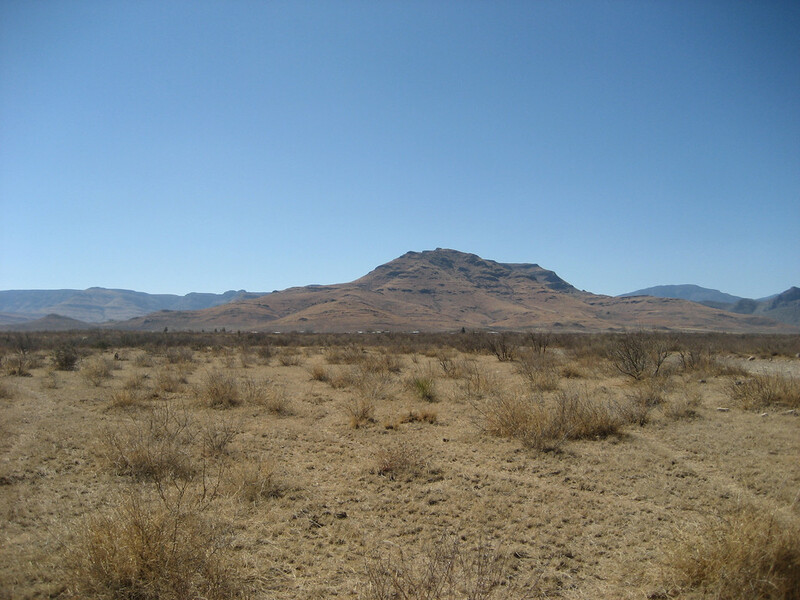 To any one who is a costumed to see their own geography back home, it is appealing to get a chance to see first hand how this rugged terrain changes from grasss plains to semi-hill side to very rugged mountain side, only the echoing sounds of silence entering your ears and the continous desert breeze are comparable to such majestic lands. It is truly beautiful to the eye of the beholder. 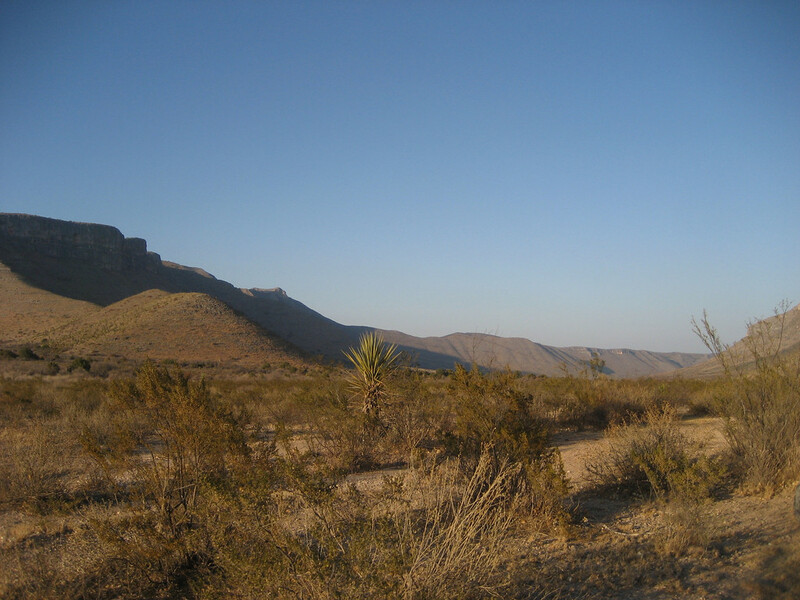 The Canyon del Colorado, offers you many opportunities to get lost...literally. You get so caught up with the landscape, it is very difficult to not appreciate the land on both sides of the doors, you seem to forget that there are many forks on the road and with out notice. You just succumb and get the wrong one. As a word of advise, if your aiming to cross the Canyon and jump over to SDC and meet the greater sister: MDC ...always stay to your right. ALWAYS. If you did not know, all the hills there have names, even the locals get sometimes confused by the inmense of the terrain. They too need reference to move thru them. It helps to know where ou are standing and find a reference point to get your vectors. To me this part of the desert is a truly 4x4 enthusiast paradise. You can not overcome the feeling of staying there for the night and capture, her other side of her face, when she reveals it with a star show like no other. The mountain sisters. 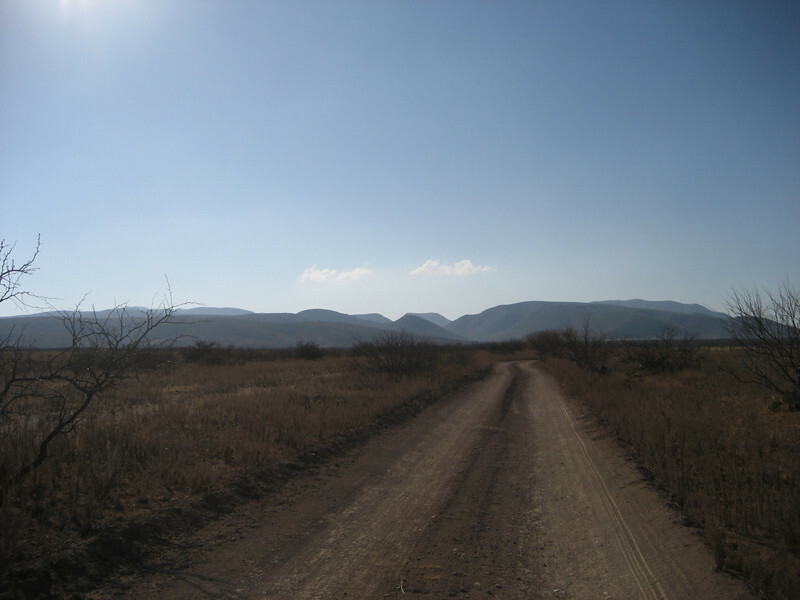 to the left the Sky islands; Maderas Del Carmen...to the right: Ol' beautiful Sierra del Carmen, from a far. 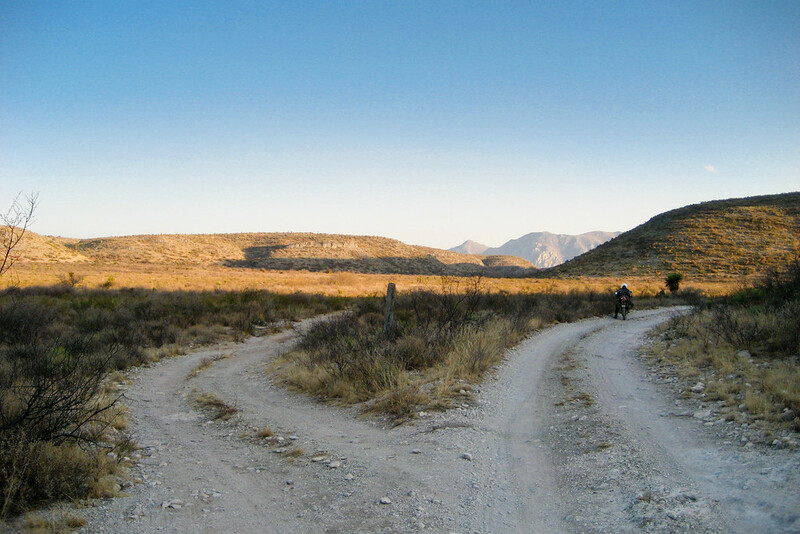 One last shot, parting ways from Canon del Colorado (Sierra del Burro). 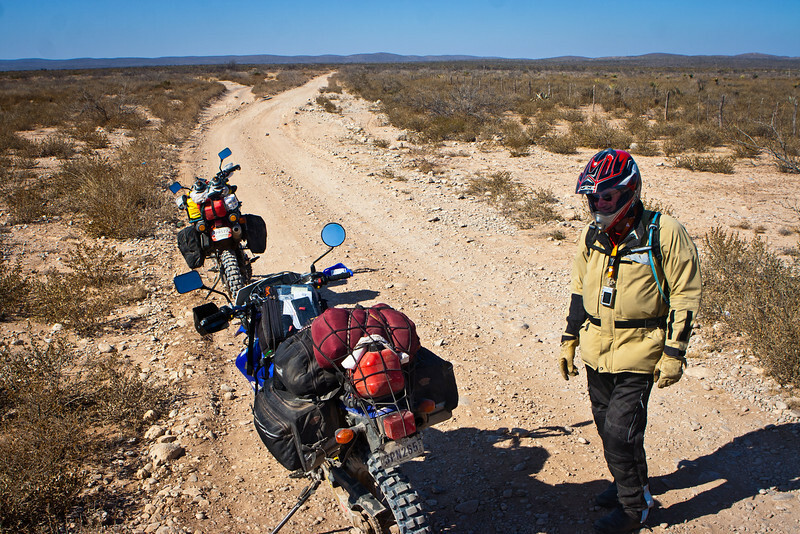 The moment, you put the pedal to the metal you begin to enter the Valley of the Buras (Valley of the Mule Deers). Vast, enormous, majestic are just a few of the words that come to mind. How ever true to the fact of it's beauty it is also brutal, weather wise. I have had to endure the hottest temperatures of a given summer there. I tell you, it was piping hot to stand there. But some how the local people endure, they are very tough just facing the fact that they have to live here. 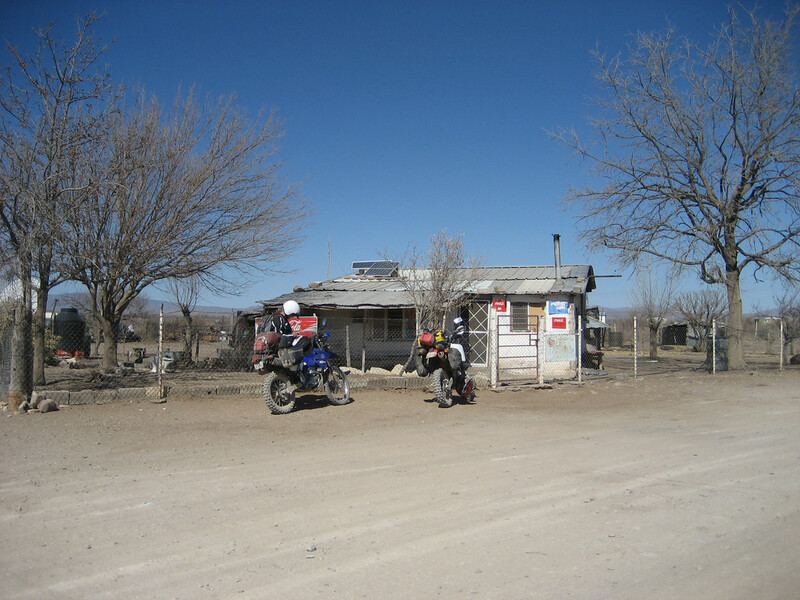 Riding along the dirt road, you begin to get a glimpse of civilization . It is a breath of fresh air and relief to see there are humans at eye distance....barely visible, if you pay attention to the picture. Nearing the Village. I am not sure if it is Ejido Morelos or Ejido Carranza (they are so near from each other, just about 10 clicks apart). You get a first chance to go and see the local Doctor, should you have a medical condition to check out. 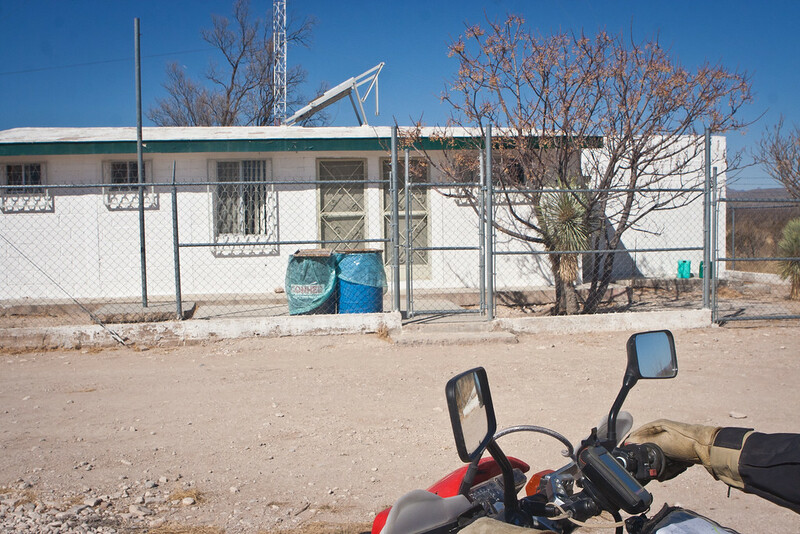 They have there Satellite phone , Sat-Med communications as well, and an array of facilities to provide medical assitance, before you have to get medevac or take an ambulance to Muzquiz or Acuna. In my opinion, it is a very well staffed emergency center. Time for a cold brew?....you should have no problem in the town store, plus you can get a decent dinner and chit chat with the locals to get the latest nitty gritty. 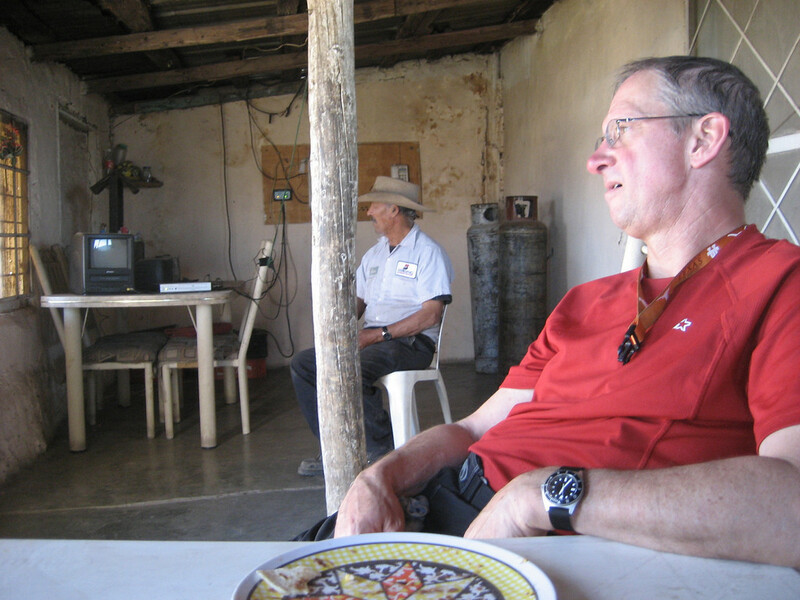 Looks like our friend John had a great Tortilla meal and is battling not to go to sleep and enjoy a well deserved Siesta . Or just getting out of the sun, for a couple of hours is just good as well. Maybe you want to get the latest news from the T.V. satellite system, go ahead you can get the latest from any where in the world. One thing i can not guarantee, right now is internet. I know it will be very accesible in the next 2-3 years, the government is laying ground for electricity fed internet all over their power grid. But for the time being, i am not sure of this in this corner of the world. Still interested in going there?...The area is bustling with activity from the operations of the Agua Chile Fluorite mine. I did a Trip Report a few years back. 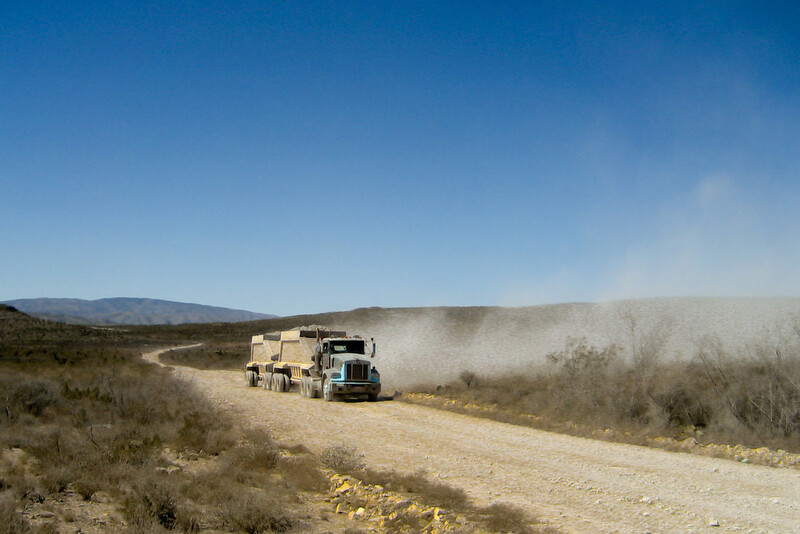 The twin hopper trucks go back and forth from Muzquiz to the mine 7 days a weeks 24/7 365 a year. Will pick up this thread again, maybe ma?ana?...Enjoy. Magnificent shots, homerboy2u, and outstanding commentary. Thanx! Excellent , looks as though we are doing a good job here...let's move long. So what exactly is in a name here?...what is the purpose of riding thru these barren, water deprived (up to a point), almost no trees down at the baseline land?...why are we so atracted to these uniquely carved natural mountain ranges?...for starters, i say it is the silence. Even the wind does not make a noice, unless it wants to be heard. I would also say the landscape, once you are in the middle it is next to impossible to get it out of your mind. It seeps in so deep in your soul, it is a loose battle to even think of something else, for a good long while... it is enchanting, one would add, but captivating as well. Now, i bet you are reading this, and relating with every word i say. Fact of the matter is, the whole area. 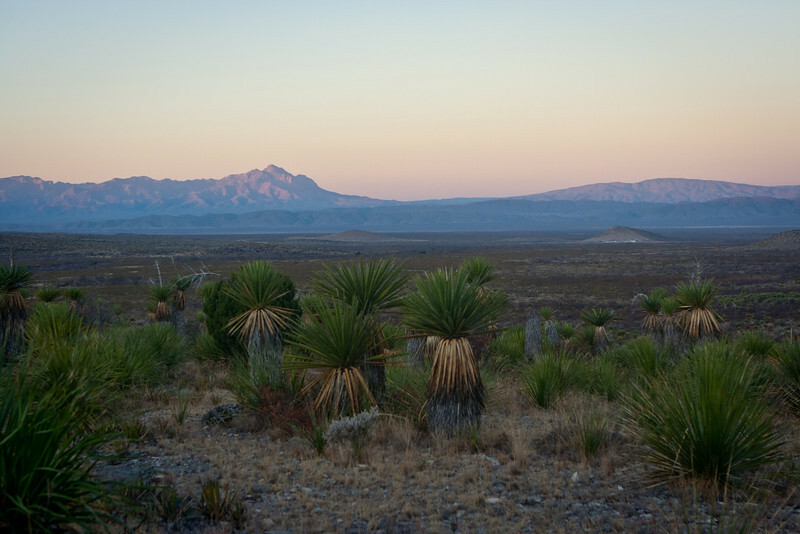 The complete Big Bend- El Carmen reserve is one land, divided by us humans in to political borders. But the wild life living there does not care. They roam freely as they would do so, our human ancestors who have lived off the land for so many thousands of years, were also contaminated by it's beauty that even though it was a hard life, once they got the handle of it they realize it was not hard at all, just a normal way of living which only the tough can live by. Only the fittest can and do call it home. and it provides everything for those who aim to live off of it, as many generations have done so. Now believe me when i tell you: There is a lot of water out there, if you know how to find it. It is the most important element in covering the first requirement of sustaining life. Once you know how to find it, how to collect it, the next steps are just a cake walk, comparetively speaking that is. For nothing out here is easy, it is just relevant to the previous tests you have over come in surviving this environment. It is a test of becoming part of this great ecosystems which in time, you begin to protect it enviously to help preserve it. It is just too captivating ot ignore. And we know that by heart. 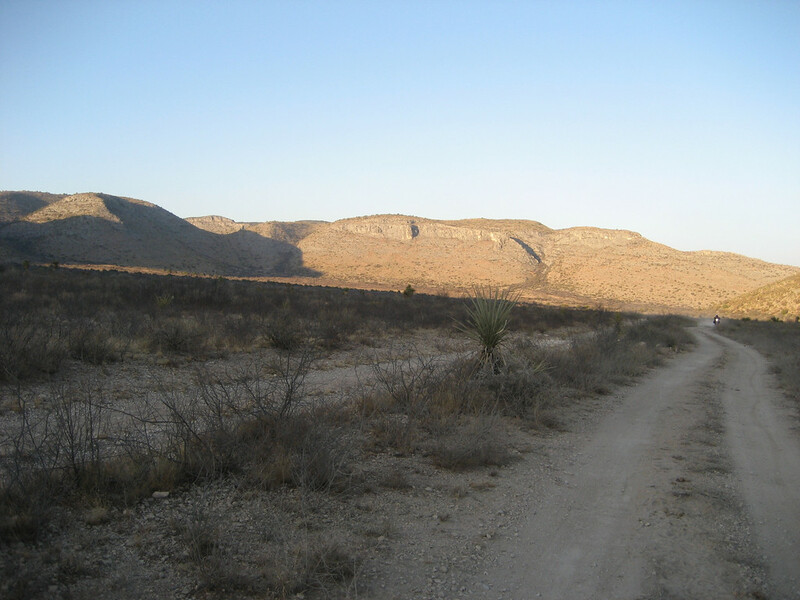 We who live in Coahuila know that the deep rivers that flow thru our land, do not run above ground they run deep. At least the ones that maintain these ecosystems. They run very deep under ground and ever so often they surface to share their wealth of nutrients, such as you see them in the Hot Springs along the area and in other artesian springs, this side of the Rio Bravo river that give testament that this land is generous to those who learn to respect it...like so many humans in the past. Not limited to this area, there are many other areas nearer to this one that change completely the landscape and also share their life giving transparent blood represented by water that do surface and are crystal clear. So many generations have come to learn this and shared their knowledge in so many forms possible. One of them, would be the rock paintings, mortars on the ground, old cave dwellings, so many marks of human presence that we are just starting to learn from them. Thru reading in a lot of books of the area, i have come to conclude of the relations of humans then and now, how they have struggle to survive and not knowingly have passed on their survival skills to the next generations . And so on and so forth to this day. They are survivors and know so much of the land. Like the Paleo Indians of the area, like the Comanches and Apaches who were the best survivalists of the time, until they were killed off, for so many political reasons. Right or wrong, they were in the way of progress. They never learned to co exists with the new arrivals. It was obvious that the old traditional way of living was going to clash straight up with the new settlers who were actually industrializing the cattle industry in the area and that idea clashed with the traditional way of life. But that new way of living, also, in time was doomed to thrive. It was sentenced by other political factors that would reclaim the old ways of living. Self sustainment for starters, greed for bigger chunks of land, revolutionary wars and independance movements. All in time, would run the settlers away from the area. Only the stubborn, persistent people who called the land as their own, stayed back and continue to live off it, as it was intended in the first place; Coexisting with the rest of the species who live off the land as well. And their descendants are still managing these lands and are very succesfull at it. Some families have kept the land for generations here. Some spreads run in to the 100's of thousand of hectares. They have, generation by generation. Hard work and struggle increase their spreads always keeping in mind the most important thing in this area is preserving the land no matter what. They live here, most of the time. They know no other form of living than this one. They are very quiet, like the Serrano people that are known for. They are very much like the area they live in: Not very talkative, always hearing the wind and watching the land, always looking for something out of the way. They are experts at living off the land and see it as a normal thing, not realizing they are at the very top of the food chain. In this ecosystem they call it home. But they are very humble, they are Gente Serrana. Now, with this that I have share with you. This is knowledge I have come to terms over the years analyzing with my trips to the area. Try and reflect of the vastness of the land, try and put yourself in their shoes, try and imagine how hard it was to make it to the next day, try and imagine....just imagine, how hard it was to put food on the table. And quickly you will learn to respect the area, respect the people who live there, respect the wildlife on the Ecosystem. Adn now try, just try to catch some sleep if you can. There is so much to ponder, there is so much to think...like it or not, you are making a film....una pelicula for the mind. I hope you get some good Zzz's out of this, and hope to see you in the next chapter. Where these gentlemen, captured a way thru El Jardin Canyon and showed us, there is a way thru the rocks flooded there in the 2006 flash floods. Again, muchas gracias homerboy2u; simply an outstanding post.